Sniff is first and format designed to help kids learn programming. However it turns out that it works pretty well for a lot of tasks. In particular it makes writing simple Arduino programs to collect data from hardware really easy. Quite often I've used these to do simple physics experiments, either plotting the collected data on an Arduino TFT screen, or recording it to and SD card for later analysis. A third option is to simply send it back to the "big" computer for processing there. I'd noticed a few Arduino programs written in C++ that throw data to a companion app on the PC, which does something with it. For example there's a LittleBits demo which uses a sensor to control a pong game. However there's something weird about all of these demos: The Arduino code is written in C++, and then on the host side they tend to use Processing which is Java. The standard Arduino system looks like Processing but the code is in a different language. That's just crazy! While "real" programmers should certainly consider using the appropriate language for different parts of the problem (Sniff itself has components written in C, Objective C, Bash, Yacc and even Sniff itself), its really not going to help someone learning C++/Arduino to jump back and forth with Processing/Java. Sniff on the other hand runs great on Arduino and Host machines (by which we mean the machine with a proper keyboard and screen that you write Sniff programs on). In fact it already contains all of the pieces we need to write a Sniff program to run on your PC to talk to a Sniff program on an Arduino - this is exactly what sniffterm does when you click on "Terminal" in sniffpad, and its all written in Sniff. ..set message to join message ","
We start by sending a reset message to the Host telling it that this is a new set of data, then simply read the temperature every second. We join the current time with the data sample and print it out. This automatically goes over the serial connection and we're done. The interesting bit all takes place on the Host (Windows/Mac/Linux Machine). ..say "Arduino device not specified"
To talk to the Arduino we need to use the serialPort device. This has been around for a while now, as its used internally by sniffterm, but we've not talked about it as this is the first time I've used it in an example program. The serialPort uses the string serialData to communicate. During initialisation the device sets serialData to be the name of the serial port that the system thinks the Arduino is connected to. This is the one we want, so we check that's set to something valid. If not we quit (you could of course set the port explicitly in your code at this point). We then tell the serial port to "open". This time serialData contains potential error messages, so we check if we've received and error message, and once again quit if we have. The code I use in the final version of my graph plotter is slightly more complex, as it displays these messages in a window, but that's irrelevant to the serialPort device. If all is good we start the receiveChars script which collects data. ..if not serialData = ""
....repeat until index>length of serialData or letter index of serialData=","
This script runs forever, calling "getString", which fills serialData with complete lines from the Arduino (it collects them internally, so the user code never sees partial lines). If its the string "reset" then it deletes all of the data currently on the screen. Otherwise it goes through the string looking for a comma, indicating the end of the abscissa (X part), and start of the ordinate (Y part). These get added to two lists of numbers: dataX and dataY respectively. 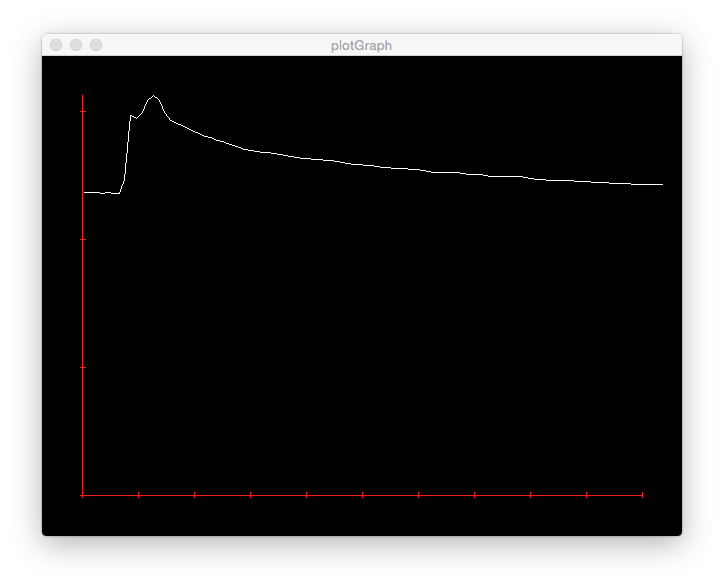 It then calls "drawScreen" which redisplays the graph (I'll not go over that as I've covered it in other posts). This code checks if the user has pressed "r","y","x" or "q" and resets the data, autoscales in y and x or quits as appropriate. And here are the results. In fact I was out of coffee, so I just blew hot air onto the ds18. We can see that its temperature peaks at a little over 30 degrees (each axis tick is 10 units), and 90 seconds later is almost back to normal. Best of all we can clearly see that the graph is curved. The graph plotting program will be in the Hosted examples of the next Sniff release, along with the Arduino genGraph.sniff code. However the important thing to remember is that this is just one of the things you can do combining Sniff on an Arduino with Sniff on a PC - how about using hardware connected to the Arduino to control Minecraft on a Pi? The point is that the Arduino just has to print data to the serial port, and the PC can pick it up and use it, and both sides are written in the same programming language. Binary search is a pretty neat (and tricky) concept. We have a sorted list of numbers, and we want to find out if it contains a particular number. We start by checking the middle number of the list (the median!). If the number we're looking for is higher then its in the second half of the list. If its lower then its in the first half of the list (if at all). Because it halfs the size of the list each time, it very quickly find the number even for large lists. However its harder to implement than it sounds. This is famously evidenced by the first paper on the subject which demonstrated the algorithm in 1946. The first correct demonstration was in 1962. For 16 years this approach was known, documented and used, yet never once implemented correctly! There's more details on what can go wrong here. The reason this crossed my mind was when Alex challenged me to guess his favourite number. Having established that it was between 1 and 100, we then proceeded to play higher or lower until I established it was in fact 95, which took me 7 guesses. It took me 7 guesses because I used a variant of binary search. The algorithm isn't exactly the same, but it uses the same divide and conquer approach. I realised that coding up this guessing game would be a neat introduction to these kinds of problem. You could get kids to just play the game, and see you long it takes them to develop an optimal strategy, then get them to write down how they would do it, before finally coding it. Cutting to the chase... here's the code in Sniff. .say "think of a number from 1 to 100"
.repeat until letter 1 of answer = "y"
..if not letter 1 of answer="y"
..if letter 1 of answer="h"
..if letter 1 of answer="l"
We initially know that the the number is greater than 0 and less than or equal to 100. We then avererage our upper and lower limit, and round to the nearest whole number to produce our guess. Note that because we round up values ending in 0.5, if we've narrowed the range down to a gap of two (0...1, 99...100 or n...n+1) then the next number will be the upper of the two numbers. For that reason we need the range to be 0...100, rather than 1...100.
we then ask if our guess is correct (if it is then we're done! ), and if not then if the secret number is higher or lower. We reduce our range based on the answer (strictly we should reduce highGuess to guess-1, but its not essential for the game - these are exactly the sort of things that make binary search tricky though). The code will win the game within 7 guesses at most! Other strategies might get lucky (maybe I could guess that Lightning McQueen might have influenced Alex's choice of number), but in the long haul this is an optimal approach. Having coded it to run on-screen, I figured it would be fun to run it on something more portable. The Arduino Multishield has been a handy toy the last few weeks: it has a numeric display, and three buttons so seemed ideal! Now we run forever, with button1 meaning lower, button3 meaning higher, and button2 for spot on (which resets the device). The great thing of course is that though it takes 7 guesses to handle numbers up to 100, it only takes another 3 to handle numbers up to 100. How many guesses to handle numbers up to 1million? From here you could easily go on more advanced divide and conquer algorithms, from binary search all the way through to quicksort, and FFT's. Ages ago I picked up one of these MQ3 alcohol sensors. They're part of a whole series of similar sensors which can detect the levels of various gases. Most of them are a few pounds so if you have an application where you might be worried about specific chemicals then you can pick an appropriate one. The exception to this is the Carbon Dioxide sensor which is hard to get and expensive, which is unfortunate as it would actually be interesting so see how levels change in rooms as they fill up with people. As I just wanted to play around with it, I picked the alcohol vapour sensor - I figured alcohol was something I had easy access to that I could use safely. Though you can get them separately, its easiest to buy the sensor already mounted on a board, like this one. These generally have four pins. Two are for gnd/power, and the other two are outputs. Of those one is digital, in that it either turns on or off when the gas level reaches a certain threshold, setable by a small pot on the back. If you just want an alarm, you can hook this straight to a piezo buzzer, and you're good to go. We're more interested in the other output - the analog output which produces a voltage dependant on the gas level. This will connect straight in to an Arduino, and as I just got a multifunction shield, I though I'd use that. .set buzzer to high #or it will make noise! Easy! we just read the value (which will have a value between 0 and 1) and scale by 100. But what does that value mean? Others have conducted this experiment and failed to accurately calibrate these sensors. This is in part due to them forgetting to write down the results during the more intensive parts of the test regime, but there's general consensus that its hard to get any specific numbers. In my tests the reading generally started around 20 when I turned it on, but as the sensor warmed up (its got a heating element in it), the value dropped to around 3. Putting it near the top of a bottle of vodka instantly spiked the value to around 20 again, but it dropped back again quickly when moved. Drinking a tiny amount (in the name of SCIENCE!) so there would be alcohol on my breath, produced similar results (15-20), but the level on my breath dropped back down again fairly quicky, as the vapour dissipated from my breath. A more extended test involving half a bottle of red wine (no one said this was going to be easy) produced a reading of around 15 some time after I'd stopped drinking. As there was alcohol in my bloodstream, the level on my breath was fairly constant. Putting these together I came up with a fairly simple ad-hoc approach which should detect the basics - record the minimum reading the sensor has ever returned as a baseline. If you blow double that you've been drinking but are probably quite sober. If you blow 4 or 5 times the minimum you're probably having a good time. If you blow 8 times the minimum, then you're wasted! That's pretty easy to code. Each time around we just check against the minimum, and update the minimum if the new version is lower. We check if the reading is higher than 4 times the minimum and sound the buzzer if it is. You can adjust the threshold for this depending on if you want to scare your kids, or set a frat house drinking challenge, but 4 seemed a fair value to me to call someone drunk and set of the alarm. It's important to remember that this calibration is pretty arbitrary, and even if it was correct it only applies to the sensor I bought, not the one you have - under no circumstances you should you think you're safe to drive (or do pretty much anything) because some circuit you found online says so! So given this is just for fun, lets have some fun with it! Here I've added a fakeResults flag. When fakeResults is true it sets the reading to 5 times what it should be, and sounds the alarm (remember the buzzer is logic low). In regular mode it works as before. So how do we control the mode? Well we could just use a button, but it might be a giveaway that you're cheating. The multifunction shield has a socket for an IR receiver. If you get a tsop4838 (about $1 on eBay) then it will plug straight in to the left three empty sockets. To use it all we need to do is make a receiveIR device on pin 2. Then tell it to "read". It sets a variable keyPressed to a different number for each key (just write a program to print out keyPressed to find the appropriate values for any remote). Then we check if a key is pressed and use it to toggle fakeMode. In the previous post I outlined the hardware of the multifunction shield. The plan now is to build a few simple projects based around it, so lets start with something really simple. We have a button, and we have a screen, so lets generate some random numbers and make an electronic dice. Everything above is standard code which sets up the 7 segment display on the multifunction shield. Show digit allows us to display a value on any of the segments, with an optional decimal point. We wait until the button is pressed (logic low), and set the message to the value of the number. After the button is pressed and we've updated the digitVal, we wait 0.1 seconds then wait for the button to go high again. This is to "debounce" the switch - when you press a switch it can bounce a little, so flips high and low for a fraction of a second before being firmly pressed. Adding a little delay stops this happening. Never gamble with a computer! There's a serious problem. Every time you run the code you get exactly the same results. Well its a computer after all - programming depends on computers doing the same thing over and over again. When you ask a computer to generate a random number, it runs some code to "make something up", but every time that code is run it does the same thing, so we always end up with the same sequence! In fact its really hard to generate random numbers with a computer. Why do you think the lottery uses balls with numbers written on them, rather than something "smarter"? There are actually companies that will sell you random numbers (they let you have them free for non-commercial use!). We pick a new random number ever 100th of a second until the user lets go of the button. As the numbers are changing to fast for us to see, and we can't accurately move/remove our finger from the button, this is pretty random. But how could we test it? If you were just interested in a little light hardware hacking, you should probably stop reading now... I'm about to go back into a whole load of maths!!! Sorry... bad habit. Not even close! I got hardly any 2's or 4's. What's the chance of rolling a dice 24 times and only getting one 4 on the very last go? Well the chance of not getting a 4 on the first go is 5/6, on two rolls it's 5/6*5/6 and so on, which means that the chances of getting 23 non-4's followed by a 4 would be (5/6)^23 * 1/6 or about 0.25% - not very likely. But not having many fours is just one of the many thing we might notice. There are 6 values on the dice. Any go them only coming up only once would be equally suspicious. Or not coming up at all. or coming up as the first and last number, or coming up in a massive streak in the middle - there are lots of "interesting" patterns we could spot. In fact perhaps the most "interesting" thing that could happen is for nothing interesting to happen. If I didn't see at least something suspicious I'd be very suspicious! This is sometimes called the Texas sharp shooter fallacy - after a guy who fires a load of bullets into the side of a barn, then walks over and paints a target around the largest cluster. We need to say what we're looking for prior to collecting the data. Here we've seen something interesting in the data, and calculated the chance of it happening - except of course the real chance of it happening is 1. IT ALREADY HAPPENED. We started with a sequence with only one 4. Thats what made us look for only one 4, so of course we found only one 4!!!! So you do we tell if that sequence is dodgy? To do it properly we need to start with our assumption (called the null hypothesis), and then look for evidence that this is not true! In this case our null hypothesis is that the dice is fair, and for any number is equally likely on only given throw. Then, we throw the dice, and then we do a Chi Squared test. Adding these gives us chi squared value of 8.25. We then compare this to a value from a table. The only catch is that there are several versions of the table depending on the "degree's of freedom". Degrees of freedom is just a fancy way of saying how many different things can change and in this case out dice has 6 sides, so we have six values that can change... BUT the last side doesn't count! Why? Because if I tell you I threw 24 times, and I tell you how many times I got the values 1-5 you already know the final answer, so the degree's of freedom is actually only 5. Here's the table we need to look things up in. If the number we get is bigger than the one in the table, then our "null hypothisis"is unlikely. If we get value of greater than 11 then there's only a 5% chance of getting that result if the dice is fair, and we "reject the null hypothosis". We got a value less that 9.2, so its fair right? No!!!!! We haven't shown its fair - just that we haven't got enough to prove that its NOT fair. Even worse - even if it is fair we'd still think it was unfair 10% of the time! So lets try and collect more evidence. We can see that the chi squared value is changing but not in any obvious way - different values of trials can produce some bigger values. Remember that just by chance, we'll get a value of 15 or more 1 time in 100, no matter how many trials we have! It really doesn't look that different! Chi squared of 3.5 means the test pulled up nothing suspicious, so we're all good right? NO! we just haven't got enough evidence yet. We KNOW we're cheating, and 6 has come up more times than we'd expect, but the nature of probability is that its very likely that this could happen by chance (in fact 3 has come up more than 6, and that is purely by chance). Here we're starting to see 6 pull clearly ahead, and the chi squared is reflecting that, but statistically we're not there yet. If we're running a casino, then we're looking out for lots of 6's, but that's not what we're testing here - a high or low score of any number would be sufficient to reject the null hypothisis that the dice is fair, so there are many ways we could get a result this "interesting". Maybe we should have used the null hypothosis "6 appears with a probability of 1/6" but that would have mean different numbers for the test, which may produce a higher chi squared. Remember the sharp-shooter: we're not allowed to change the test after we've seen the results! Chi squared keeps going up because now we really are collecting more evidence - but looking at the table, this (or something "equally interesting") could still happen more than 1 time in 100. I think the take away here is that you can't prove the null hypothosis - only collect evidence to reject it. When we ran our tests with a fair dice, nothing much happened. Increasing the trials didn't change anything - if all is fair, then chi squared will be bigger or smaller at random - we keep testing, but we never find more or less evidence, because there's none to find. We can't produce evidence that the dice is unfair, because there's no evidence to find! However when we did have some thing dogey going on, increasing trials gave us more evidence. There's a guy who takes this pretty seriously and built a machine to roll dice, and then read the values of with a camera, and image recognition system! This really was supposed to be a fun/simple hardware build, but I guess it got side tracked, but I think it was worth it. You really should simulate a bias dice (make it more or less bias), and see how long it takes to detect. Running stuff like this in code helps you get a much better feel for the maths. Also while Chi Squared is A level maths, the actually implementation is pretty easy. Implementing this sort of code is something you could do at KS4, and it would make a lot of sense if tied to some kind of practical work. In preparation for a robot workshop I ordered a bunch of Arduino Motor Controller Shields. These are super cheap from china, and can drive up to 4 DC motors. They also break out a couple of pins on servo headers, so they're ideal for getting kids to actually assemble and program a robot. In this case it was just as well as while the box did contain Arduino shields, they weren't the one I expected. Someone working on a packing line several thousand miles away, had sent me the correct number of the wrong part. They were superficially similar but completely not what I wanted. A quick search revealed that I'd been sent a bunch of "Multifunction" shields. I then quickly ordered a new set of motor shields (should be here in time! ), before deciding there really was no point in sending back the multifunction shields - for what the whole batch cost it wasn't worth the hassle of trying to get them replaced with the right thing. Besides - a new component to play with!!! 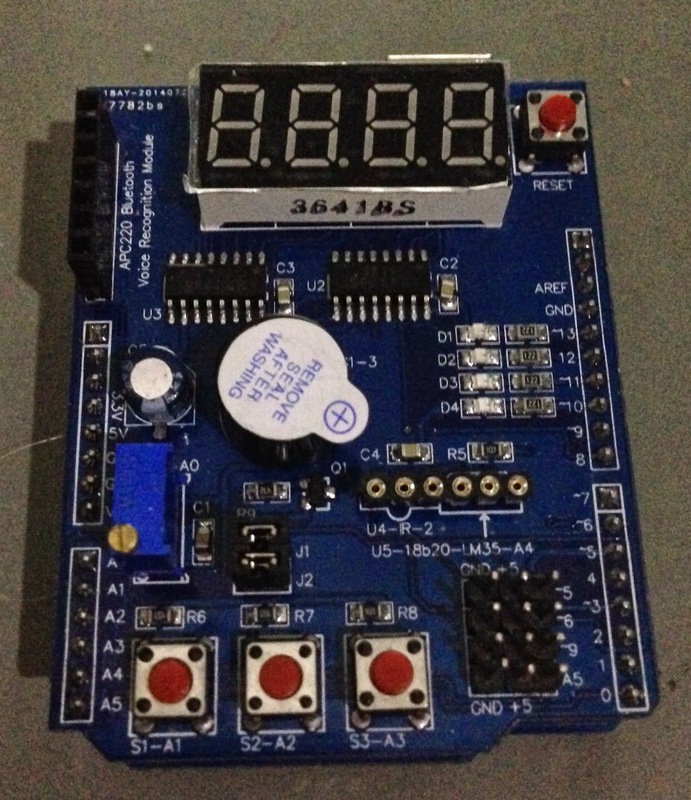 The Multifunction shield is a but of a mash up (as its name suggests), which I guess is aimed at beginners wanting quick and easy way to hook up a load of components and start programming them. Unfortunately like many Arduino shields, documentation is scarce, but some searching did turn up an circuit diagram, and some sample code - all written in Chinese. Working through these, and a bit of poking with a multi-meter, I was I was able to get the board up and running. The first and simplest things to tackle are the 3 switches and 4 LEDS. Which are attached to the pins of the Arduino, as outlined in this code. The switches have pull-up resistors attached (which you can disable by removing J2, though that still leaves the pins connected together by 10K resistors, and in any case the pins aren't broken out elsewhere, so really not much use). However they are pull-UP's, which mean that pressing the switch generates logic low. Similarly the LED's are also active low - not ideal in a board that's supposed to appeal to newbies: set led to on, turns it off, and set led to off turns it on! There's no reason to design a board this way, and while many "real" circuits are active low its enough to make me hesitate in using this with kids. The next component we'll look at is the buzzer. Note that this is a buzzer, which makes a very loud, fixed pitch beep, rather than a piezo transducer found on the pibrella. That means its easy to code - we just run it on and off using pin 3 (though again its active low). The blue rectangular block is a 10k pot, set up as a potential divider on A0. While pots can make great user input devices, this one uses a tiny screw, which requires many turns to change it. It's handy for demonstrating the idea, but something a bit bigger, and perhaps with less turns would have fitted the purpose of demo'ing analog input a bit better. Perhaps the most useful feature of the board is the set of 4x7 segment displays. These are attached to three pins: clock, data and latch. These are the sort of thing we could write a "device" for, but its actually not that hard to program them directly in Sniff. This is the low level code which loads a byte into the 7 segment display registers. To display a character we first load in a byte showing which segments should be illuminated, and then a second byte turning on (usually) one of the digits. Only one of the digits is actually lit up at a time, but we can keep cycling and it will look fine. This code shifts out the two bytes representing a number (from 0-9) and displays it on the selected digit, optionally setting the decimal point. ...if letter index of message ="." Finally here's the code that goes through the string message, and sends 1 digit of it at a time to the display. The tricky part here is handling the decimal point. If we're displaying a number, and the next character is a decimal point then we display the point with this digit, and skip over the next character. When we get to the end of the string we print a point if we haven't already, and pad with zero's. In the C examples that I found for the board the code has to keep calling display in the main loop to keep the lcd updated - remember only one set of segements is lit at once, so we need to constantly keep refreshing the display. Fortunatly Sniff can handle this more easily by just running this script when the program starts. It keeps going forever, updating the display in the background. Earlier we wrote a script which reads a value from the pot and assigns it to the string message. Now this is constantly displayed on the LED display. In fact because the Sniff scripts that make up a program can all run at the same time, we can run the code for the pot, the display, the leds, and the buzzer all at the same time, in a single demo, rather than writing a demo for each feature! 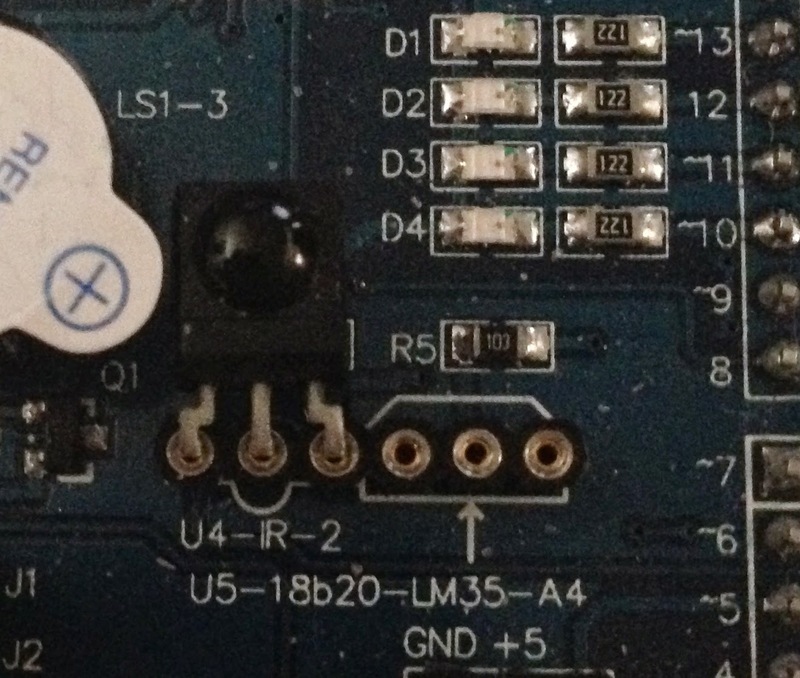 In addition to the built in devices on the boardthere are breakout pins and sockets intended for various purposes. There are four 0v/5v/Signal servo headers. Of course to use them with servo's you would make them digital outputs, but they can equally be used as inputs (and/or analog if the pin supports it). The block of 7 header in the top left has 0/5v on the first two pins, and serial (Arduino pins 0 and 1) on two of the others. The block of 6 pins across the middle is designed of attaching an IR receiver on pin 2 in the first three holes, and a temperature sensor on A4 in the second. From left to right the pin out is D2,0V,5V (for theIR receiver) then 0V,A4,5V for the temperature sensor. 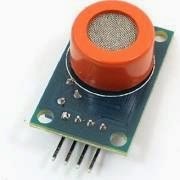 The temperature sensor can be an LM35, or a ds1820. In the case of the DS1820 J1 provides the required 10K pull-up on the data line - it can/should be removed it you're using A4 for something else. Both a TSOP4838 IR receiver, and a DS1820 should just plug straight in. Though its not obvious there are little white outlines on the board - match the shape, to know which way around. So that's the technical spec's of the board. The buttons, display, and servo header pins are all pretty useful, as together these have the potential to work well for a range of experiments, the negative logic is annoying in a beginners board. It's also a shame that i2c isn't broken out. I know that's advanced for the target audience, but this would give access a bunch of sensors, which could simply be read, and displayed on the 7 segment display - instant win! A4 and A5 are broken out and unused, but in different parts of the board, so it would be messy (you could install a breakout/io shield underneath just to get i2c, but really?). I could definitely see then being useful in a workshop. Give me a few days, and I'll post some examples of using the board to do something fun! Normally I blog about fun programming exercises you can do using Sniff. Often this involves robots, flashing lights, and physics experiments. They're usually appropriate for kids somewhere in the age range 10-16. Recently however we've got a little off track. It started innocently enough with a simple Monte Carlo Simulation, but then moved on to root finding. It got a bit out of hand with Taylor Approximations, and then Newton Rhapson. If you're looking for a fun exercise for you KS4 physics class check the older posts on the right! Newton's Method for root finding (or strictly the Secant Method, as we're finding the derivative analytically) works pretty good. It fits a straight line to a function, then solves for the straight line. Then we repeat again using the straight line solution as a starting point to fit a new straight line. We're about to leave anything that's relevant to anything that's taught in schools - so lets abandon any pretence this isn't about calculus. I'll also abandon any claim that I actually know this stuff - my maths is pretty good, but I don't have a maths degree, so there may be some inaccuracies in here! This is stuff I picked up when I was fact checking the previous post! Newton Rahpson takes the derivative of a function find its gradient at a point and fit a straight line, but what if we could do better? The function isn't a straight line - its a curve, which means its gradient is changing, so we get the wrong answer. But what if we could include information about not just the gradient, but how the gradient was changing? Well if we plotted a graph of the gradient, what would be it's gradient? In other words the second derivative! For a straight line it has a constant gradient so f'(x)=m which is a constant. f''(x) is how the gradient changes, and (for a straight line) it doesn't so f''(x)=0. But if we had a quadratic (say x*x), then the gradient does change - its a curve! In fact in this case f'(x)=2x. That of course is a straight line with gradient 2, so f''(x)=2. Newton assumes that f''(x)=0 which is why it only approximates the curve rather than getting it right. That's a bit more complex, but most of it is just an equation that we need to type in, in place of the Newton equation. As you can see it has f''(x) in the bottom right, so its accounting for the curvature. In fact we can drop this into Newtons method for slightly better results. Both of these converge pretty quick, so the results are a little inconclusive: for -2 Halley converges 1 step faster. For the root near -1 it looks like Newton gets their first... 4 steps rather than 5, but look more closely: on the first three iterations Halley is closer, and on the fourth is actually printing the right answer, but the error is 10e-7 rather than 10e-8 when it converges on the final step. Overall Halley definitely converges faster. However there are problems. The first is numerical instability. In the Newton code I used a value of dx=0.001. It worked great. In this code the second derivative requires dividing by dx squared, which would be 0.000001. Thats small. In fact it didn't work - I had to increase dx to 0.005 as a minimum otherwise the whole thing went crazy. Larger values of dx mean less accuracy to our derivatives, and things start to go wrong. The second is that we're relying on more maths. Both Newton and Halley rely on the functions we're testing to be "well behaved", but there's just more to go wrong with that for Halley than Newton. There's also more code to go wrong - we're approximating more things, and that means more errors can creep in. In both cases there are a lot of things that need to go right to produce versions of the code that work reliably (the code here is for experimenting with and isn't designed to handle when things go wrong), but again theres more to go wrong in the more complex code. The real problem however is that Halley converges faster PER STEP. But look at the work we're doing per step. It evaluates the function three times, rather than two, and then does a lot more maths on those values. Overall, although Halley uses less steps it probably uses about the same, or more cpu time. Computers are really good at doing lots of simple steps, so giving them the simpler code, and letting them run it fast, with lots of iterations is probably the better solution in the real world. Even if this doesn't necessarily produce better results, it was still fun to try it, and there are a lot of good things to be learnt about implementing numerical analysis in code. We now return to our normal programming. Taylor Approximations - further maths!